Activision and Bungie are preparing an unforgettable Destiny 2 event for May 18th. There will be a gameplay live stream, of course, for everyone to see via streaming platforms like Twitch and YouTube. But we learned today that members of the press and YouTubers/streamers have also been invited to actually play the game on that day. 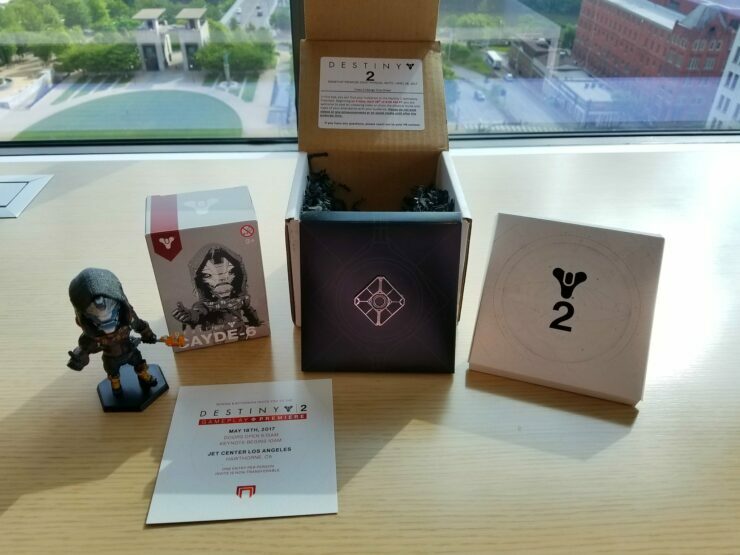 You can take a look at the admittedly cool invite box below, which includes a small Cayde-6 statuette. According to YouTuber Skill Up, though, a very large number of community members has been invited for the occasion. He also confirmed that both a console version (probably PlayStation 4, given Sony’s marketing deal) and the PC version will be available to play, which speaks volumes about Bungie’s confidence to deliver a polished and optimized version of the game on the platform. The keynote will begin at 10AM PST, in case you need to set the clock. We don’t know a lot about the game, but this Destiny 2 event should change that considerably. What we do know is that the game is due on September 8th, 2017 for PC, PlayStation 4 and Xbox One. There will be a closed beta available to those who pre-order Destiny 2 and an open beta closer to launch. The first two expansions are scheduled for Winter 2017 and Spring 2018, offering brand new story missions, cooperative activities, competitive multiplayer, and a wealth of new weapons, armor, and gear. It will be a new beginning, meaning that former Destiny players won’t be able to carry over items, possessions and the likes. Cosmetic things like class, race, gender, face, hair, and marking selections won’t be lost, though, and veteran accounts will be rewarded with “honors” reflecting the accomplishments made while playing the first game. Are you excited about taking a look at Destiny 2’s gameplay for the first time? Let us know below.